It is necessary to keep your gutters clean so that the water drains properly and away from your structure. Gutters should never overflow. Clearing is commonly done wherever there are no screens or other device to keep the basins free of debris - however the advantage to having open gutters is that there is always quick access, without multiple pieces to remove and put back on. 1) Set an extension ladder or a tall step ladder to access the gutter basin. For an extension ladder, slip on some padded mitts at the top end to protect any siding. To get closer, attach a stand-off at the end of the ladder, while setting it against the wall and not onto the gutter itself. The ladder feet must be set firm and level onto the ground. 2) Carry up a 5 gallon bucket and clip it onto the ladder with a paint hook, or to the gutter if there is not much weight in it. 3) Wear thick gloves, since there will be sharp metal edges within the gutter area. 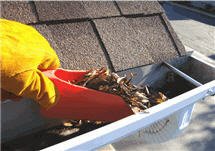 Using a plastic gutter scoop, push it along and lift out the leaves and debris. Brush out the finer stuff at the bottom with an old paint brush. If there are decomposed leaves and other matter turning to mudd, plow it up and out with the scoop though some surface amount will probably stay. 4) Clean out the downspout screen inserts. If they are rusted then replace them. 5) Run water into the gutter with a pressure nozzle. If there is a heavy residue still inside, consider running water while working a rag or small sponge along the bottom, removing all the little natural catch points that start to build. Be extremely cautious of using water from an extension ladder. 6) Verify that the water discharges out the downspout bottoms. The water should run free with no leaking at the seams or through any holes. If water leaks, it is time to patch it. Consider sealing leaks and repairing sags and mounting screens or gutter guards after you are done.